One of the largest charity car shows with over 3,000 automotive classics filled the Orange County Fairgrounds this weekend. Cruisin’ for a Cure did not disappoint. Getting to the show early is key for us because we want to get the shot with the least amount of noise. A few Rancheros dotted the landscape, the owner of this little red ride was more in tune with the motorcycles, of course, it was the Ranchero that caught the camera’s eye. There is nothing better than a big giant American flag flying over a car show so when we stepped outside the sun was rising over this beauty so had to share it. Classic car shows create a fun environment where you meet a lot of different people, inside one of the venue buildings was a set of miniature cars created to honor the military, there is a story to be told here, but the one big surprise is that history like cars is everywhere. Look for photos of the show this week. 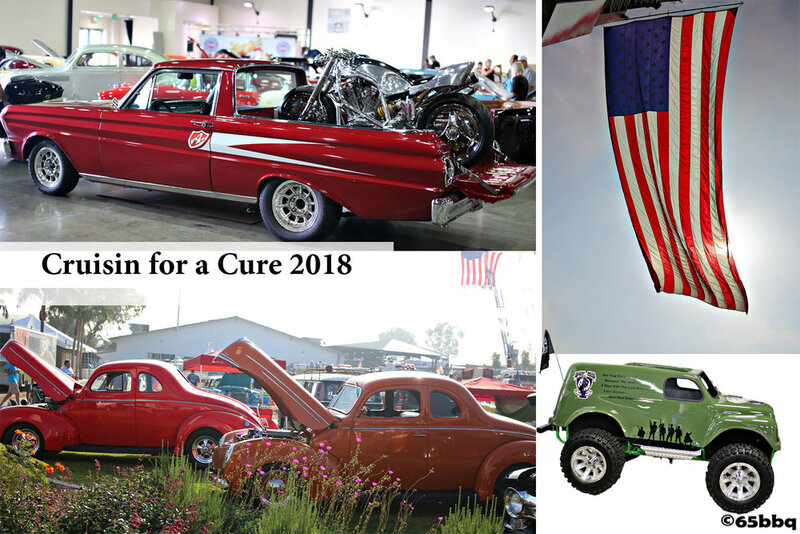 To catch up on past Cruisin’ for a Cure car shows click pic above or go the the GALLERY Cruisin for a Cure. Message to Frank, after 47 years it was good to see you thriving, volunteering and creating reminders that our military is what keeps this country strong.